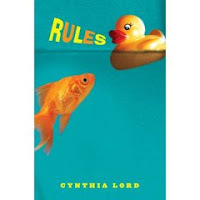 I was quite happy when Rules won a Newbery honor. In 2006, when this book was published, I worked as a library assistant at a special library with a collection of disability-related materials. Because of this job, I have a special interest in books about kids with disabilities. Still, I didn't manage to pick up this book until I was invited to a wedding this past August. The wedding was in Indiana, a five-hour car trip away, and I stocked up on plenty of listening material to pass the driving time. Due to circumstances beyond my control (massive flooding due to massive storms in the greater Chicago area), the five-hour car trip stretched into a nine-hour car trip. Thank goodness I had the audiobook of Rules to entertain me during four hours of that awful trip! "This book was completely not like I thought it would be. It's about Katherine, a twelve year old girl trying to make a new friend and deal with her younger brother David who has autism. One day while she's at the clinic where David has occupational therapy, Katherine meets Jason. Jason is another patient at the clinic. Jason has cerebral palsy and he communicates using a book with pictures. Katherine creates some new pictures for him and begins a friendship that becomes very important to them both. Katherine learns a lot about communication and the importance of having words, even if they're negative words." I knew before I started listening that the book was about a girl with an autistic brother. I did not, however, expect the character of Jason. I loved the friendship that develops between Katherine and Jason. It's not always an easy friendship, but it helps Katherine to grow in ways she didn't expect. I think this book is an important book. It's a book that portrays a relationship not often portrayed in the middle-grade novel and it portrays it well. On top of all that, I think it has a down-to-earth protagonist that will actually appeal to kids. As I mentioned, I listened to the audiobook and I thought the narrator was perfect for the book. Don't hesitate to pick this one up for a solid listen or read. I loved Rules and was surprised by it as well. It went somewhere entirely different than I expected, and I was really impressed with it. In your review you said: "I did, however, expect the character of Jason." Did you mean that you did NOT expect him? I wasn't sure. I know I didn't expect him. I thought he took the book in an entirely different (and terrific) direction.